I make reference to domestic abuse, domestic violence, PTSD and the violence against women act in various social media channels I am present in – but I haven’t really spoken openly about it in a public forum to any great degree, but 5 years on from my independence day, I feel like it’s a fitting time to open up. Last weekend my story was written and published by a London journalist and featured in the Sunday newspaper (see below) – this was the very first time my story was shared outside of my immediate family and friends. It hurts to read and I know neither my husband or my parents have read it and I understand why, but it isn’t something I am ashamed of, it is something I gained from. On July 4, 2008 I left my, now, ex-husband. Saying “I left him” takes away the emotion and the drama – what you don’t read in those words “I left” is the angst, fear, pain and suffering. My story of abuse is much like what many other women are dealing with – chances are you know someone who is dealing with abuse at home, it could be your mother, your sister, your best friend, the girl in the office, your daughter, or it’s you. We, the victims, or survivors, hide abuse well, our abusers hide it even better. We feel ashamed, we feel like failures, like we are letting everyone down, like it’s our fault. When I left my ex-husband, I was running, literally running for my life, running for help, terrified, terrified, that July 4, 2008 was going to be the night he actually took that last step in the familiar abuse pattern, and killed me. At the hands of my abuser, my husband, the man I loved, I was psychologically tortured every day for over 2 years – living on a knife edge, walking on egg shells, never knowing when the explosion would happen and what it would be. I was strangled, kicked, thrown out the house, humiliated in front of friends and strangers. I was chased down and dragged down the street. My belongings were destroyed or thrown in the trash when I didn’t ‘behave’. Walls were punched inches from my head. I was held down, strangled and raped. This was, what he called love. I tried to leave, I left 6 times, he talked me home every time, with tears, apologies and promises. I believed him. I loved him. I was embarrassed. I have been diagnosed with PTSD. A lot of people don’t realize that mental and emotional abuse can damage you, affect you that badly to leave you with post-traumatic stress disorder – but it can, and it does. My abuse is over, my abuser far away, but the trauma hasn’t gone away, including frequent nightmares, night sweats, crying, screaming and panic attacks in my sleep. It took me 4 years of therapy to be able to speak with emotion about what happened – for years I was clinical in my explanation of what happened, cold, I took out the emotion because I didn’t know how to process it. I saw myself outside of my own body. 5 years on, I can now connect me, with the facts and the emotion. 5 years seems so long ago, yet I remember every minute of that night vividly. It’s times like those, that you learn who your true friends are – the ones who want to stick around and go through the trenches with you. The friends who pull you out and hold you up and support you in any and every way that they can. I vowed, that with every friend that helped me I would pay it forward. It has taken me some time to get to a place where I am financially and emotionally comfortable. Where my life is better than it has ever been and I can start to help others. I can’t donate hundreds or thousands of dollars, but I can donate my time and my experience and my advice. 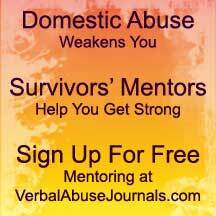 I am now a mentor to women who are going or have gone through what I went through. I am not a therapist, a counselor or a doctor, but I can help. I hope that my talking to each of these women, I am giving them the support that I had, the understanding shoulder to cry on and the strength to know that there is a way out. There can be the ‘happily ever after’. I hope that by sharing my story, I can help other women survive and find their strength. People ask me if I regret my choice to be with my abuser, to stay with my abuser for so long – I regret what happened to me, and wish it on no one, but I love the person that I have become, the strength I have. The courage I know I have and the bravery that I can be proud of. I love the strong bonds I have with those that were there for me in my hardest time they will be my friends eternally. Lastly, without that experience, I wouldn’t be where I am now, physically, emotionally, financially – and I wouldn’t have this amazing love with an incredible man, who has shown me what true love means, what a true man is like and how after such darkness and fear, there is love and light – for all of these things, there could never be regret. To my dear friends, Diana, The Kaufmans, Nick & Jenny, Andrew (amongst many things, the man who taught me to pay it forward), Jonathan and the Weisman’s – thank you for being there in 2008 and now – you have my eternal gratitude. My parents and my husband – I know these things are hard to read and thank you for your never ending love and support. So, as I am about to celebrate my first Independence day as an American, I will look back at how far I have come and how there is life after abuse. Wishing you all a safe and happy July 4th. I am a Domestic Abuse Mentor – please contact me or use the information page here to seek help from one of the group of mentors available to help for free.